← Children are being asked to organise weddings for their parents as part of a BBC drive to reflect modern Britain. www.wessexweddings.co.uk covers all kinds of wedding photography in the south-west of England. 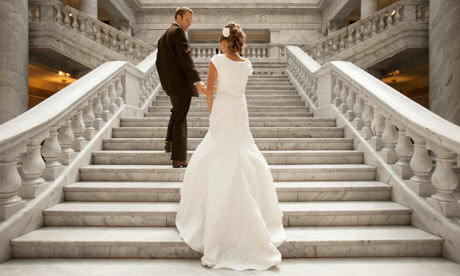 Sweeping staircases may be great for your photos, but not for brides, grooms or guests with disabilities. In November 2009, my boyfriend Darren surprised me with a romantic proposal over a candlelit dinner. I was ecstatic. But after the celebrations came the questions – when, where and how were we going to get married? As a wheelchair user, I didn’t know where to start with all the preparations. How exactly do you plan an accessible wedding? We are, of course, not alone in facing this dilemma. Aside from disabled brides and grooms, accessibility is an issue for many couples who need to consider an older or disabled friend or relative. It therefore came as a big surprise how few wedding venues have properly thought through the service that they offer for disabled customers and wedding-goers. Everything from the hen night and the dress to the venue and the honeymoon needs some serious creative thinking. Contacting other brides-to-be amongst the Muscular Dystrophy Campaign Trailblazers, I found women battling to bring their big day together, armed with a flexible approach – and steely determination. For the venue, we had ruled out a church ceremony. If, like us, you are not particularly religious, it is far easier to spend the whole day at one location for any wheelchair-users in your wedding party. We did some thorough searching online for accessible local hotels, but struggled to find one which met our requirements. The right venue needed to be not only flexible to meet our needs, but also to understand them. After months of painstaking research we found a venue that proves there is no need to scrimp on the romance. Built in 1866 in an elegant Italianate style, it is still wonderfully accessible, with lifts and ramps to all function areas and bedrooms specifically tailored for guests with limited mobility. After getting stuck in dresses and experiencing well-meaning but unhelpful assistants in bridal boutiques, my mum and I persuaded a local independent shop to let us take some dresses home to try in return for a guarantee. This proved a much more comfortable and enjoyable trying-on experience, but we struggled to find one which would work from a sitting position. Then we found Bridal Dream Dress, which will custom-make any dress to your exact requirements. It was nailbiting waiting for the dress to arrive, but I was delighted with the final result. Some aspects of creative planning have been fun. Like many disabled brides-to-be, I’ve decided that I don’t want to use the same manual chair that I sit in every day. We’ve sourced a secondhand chair that we will respray, re-upholster and customise to match my dress. For my flowers, instead of carrying a traditional bouquet, which would make pushing my chair difficult, I will have a wrist corsage. As for our first dance, slow dancing from a wheelchair is pretty restrictive. We have decided that we will ask all our wedding guests to join in to an upbeat song, taking the pressure off. I’m now looking ahead to my last night of freedom. For disabled hens, a big night out on the town is problematic. Research by Trailblazers showed that 80% of the 400-strong group experience difficulties using local pubs, clubs, restaurants, bars and music venues. For wheelchair-users, so much research has to be done to find accessible nightspots that it can turn into a military operation – not conducive to hen night fun. I will be hiring a large accessible cottage in the Lake District for a weekend of eating, drinking and relaxation. The most important thing to me is to have my closest friends together – in an environment where I don’t have to worry about stairs or accessible toilets. Wedding planning has thrown up some challenges – and ones that I feel very disappointed that disabled women are facing. The UK wedding industry, worth an estimated £5.5bn a year, is still slow to catch on to the bang of the disabled bride’s buck. • Always visit prospective venues to check out accessibility, and consider taking any wedding guests with access requirements with you. • Ask about ramps at the venue – they needn’t be an eyesore. Put a runner of material down metal ramps, to fit between your wheels. It won’t skid and will create a good look. • Don’t rule out a style of dress because you think that it won’t be suitable or accessible until you have tried it on. • Bear in mind the talents of family and friends – ours are helping us with the cake, hairdressing, stationery and my wheelchair, which makes our day more personal. • Don’t be afraid to think outside the box to make your day accessible – after all, the best weddings are unique. Carrie-Ann Fleming is a member of the young disabled campaigners group, the Muscular Dystrophy Campaign Trailblazersmdctrailblazers.org. She uses a powered wheelchair due to the condition cerebral palsy. This entry was posted in Dorset weddings, Somerset weddings, Weddings and tagged / Dorset, / Wiltshire, Chinese wedding dress, Dorset weddings, dress, in Somerset, photographer, Photographers, photography, Recommended, Somerset, Somerset wedding photographer, somerset wedding photography, Somerset weddings, wedding dress, wedding fayre, Wedding photographer in Somerset. Bookmark the permalink. Katie Price marries, again, in Somerset.